Treat yo'self: super colorful studs for $30 or less. You are here: Home / Jewelry / Earrings / Treat yo’self: super colorful studs for $30 or less. Treat yo’self: super colorful studs for $30 or less. We’re going small and colorful for today’s edition of Treat Yo’self, folks. Bright (or sparkly) stud earrings are one of my favorite ways to punch up outfits that would otherwise be lacking in pizazz – and the colder and darker the year gets, the more pizazz is necessary. These are all going to be $30 or less, because why not? Piper Strand enameled diamond stud earrings ($18). Betsey Johnson “Carnival” crystal cluster stud earrings ($30). 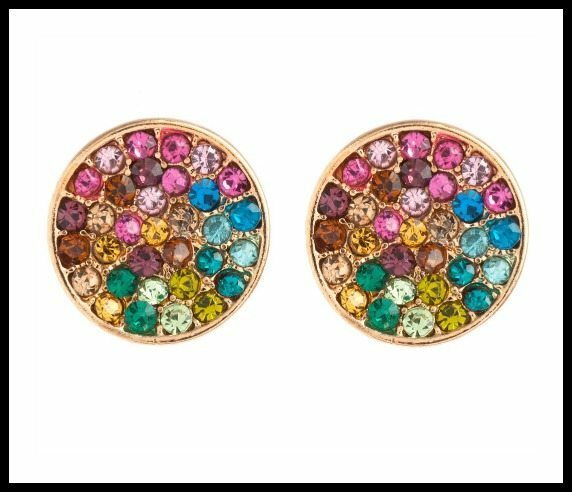 Piper Strand rainbow pave circle stud earrings ($26). Those Betsey Johnson “Carnival” crystal cluster stud earrings won me over instantly :).